It was a special thrill to find myself quoted in German. Eike Wenzel blogged today on the differences between German and U.S. Millennials. His post featured this chart (in English). It’s fascinating to see that U.S. Millennials lag those in Germany and China in their willingness to share details of their personal lives online. 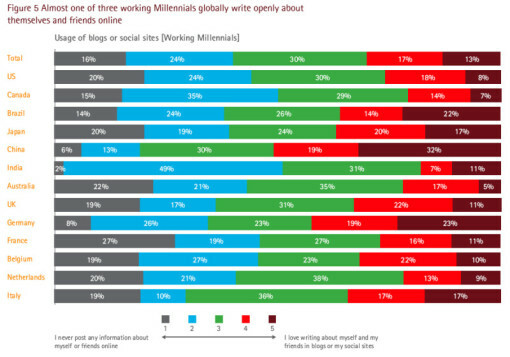 This chart shows how working Millennials around the world use social sites and blogs, and especially their willingness to ‘share information about myself or my friends online’. This compares with 23% in Germany and 32% in China. Other countries with high levels of agreement that they love to share were Brazil (22 %), Japan ( 17 %) and Italy (17 %). The only countries with a lower level of agreement than the U.S. were Australia (5%) and Canada (7%) with the U.K. coming close (11%). Yet there are some hints that the days of total transparency are waning. Just 15% maintain a blog, down 9 percentage points in two years. And with the growing awareness that parents, job recruiters, potential employers and even professors are looking at their online profiles, many Gen Y’ers have started to moderate their posting, even causing one Millennial, Kyla Butterfield, to question whether her Facebook page even represents her real personality anymore, or is just an extension of her resume. Here is an excerpt from her post on TheNextGreatGeneration blog. “All of my friends are beginning to look for jobs and cleaning up their Facebook, Myspace and Twitter accounts to make sure they fit into the cookie cutter mold companies are looking for. Honestly I am not excluded. It seemed so easy for me to adjust my interests after the parental clean up. I have realized my Facebook is just another place for me to list my accomplishments instead of express myself. Has Facebook become Linkedin? For me it has, and I’ve found myself on it less and less. Just FYI employers, you can no longer trust Facebook to be a fair representation of your potentials; for those who have wised up these are just an extension of their resumes. 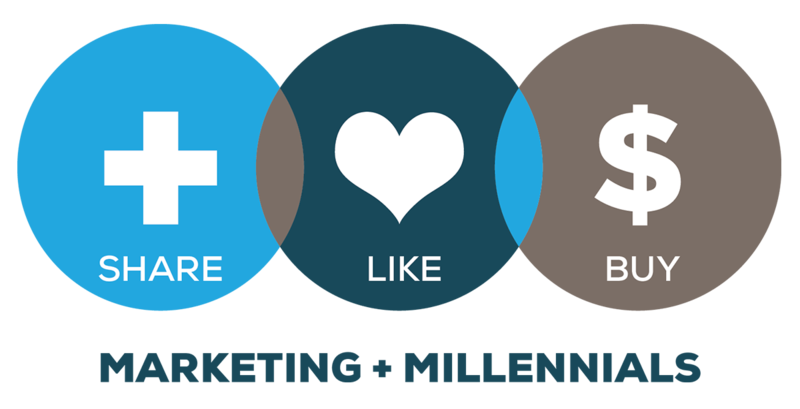 If you spend much time online and it’s easy to be seduced into thinking all young people are blogging and sharing openly. Yet I know from my students this is not the case. Most do not maintain a blog and few think Twitter is worth the time. The idea of ‘personal branding’ is not something they have given a lot of thought to. Facebook is more of a utility, a tool for planning one’s social life, and sharing photos, not maintaining a Proust-style journal. In fact it’s the over 30 crowd that is doing more sharing online these days.